Our BDSA general election is complete. 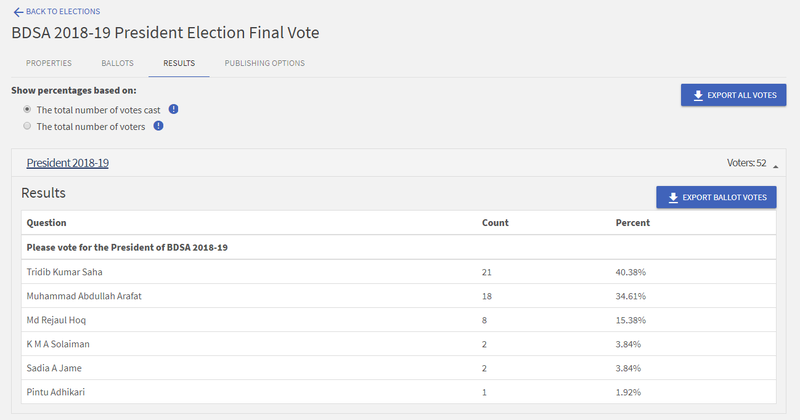 It is my great pleasure to announce the winner of the election based on majority vote. The winner is Tridib K Saha. Tridib will be requested to decide on his executive committee members and his presidency will be effective from June 1st, 2018. We will have a committee transition meeting on June 2nd, 2018. Please visit this link to see the results of the Primary election of BDSA. Top five candidates as per primary vote were selected previously for the final stage of voting. We also passed all amendments of our constitution, which will be signed by our next President.